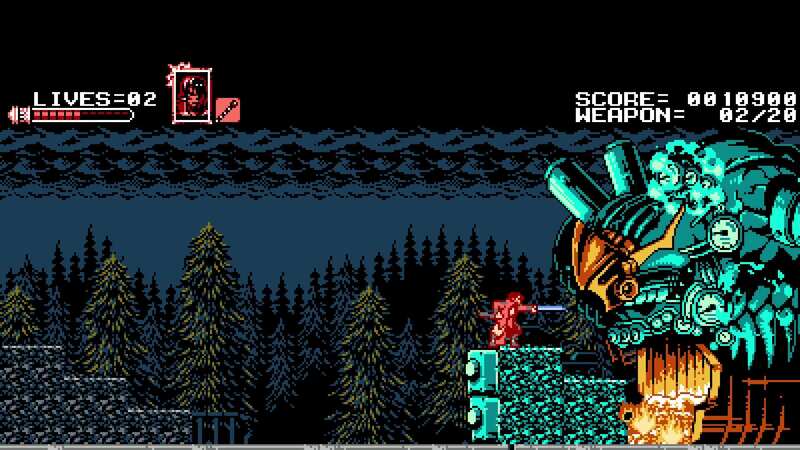 Famed Japanese game producer Koji Igarashi, known for his work on the original Castlevania titles, is in the process of bringing his powerful influence back to Metroidvania-style platformers. His newest project, Bloodstained: Ritual of the Night, is set for a 2018 release. 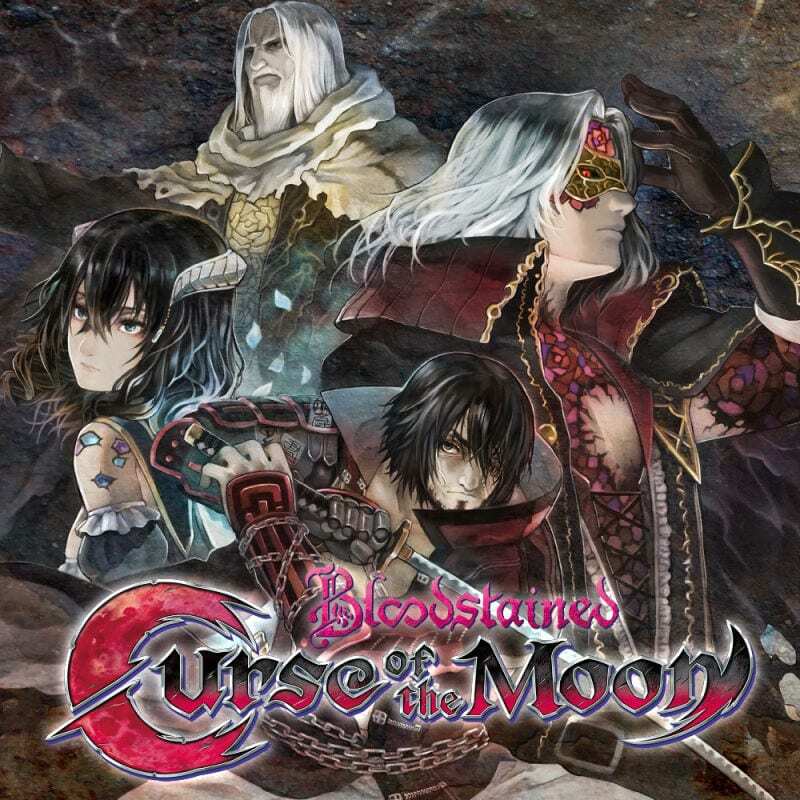 However, before we see the fruits of his labor, Iga and Inti Creates have developed and published Bloodstained: Curse of the Moon, an 8-bit prequel to Ritual. 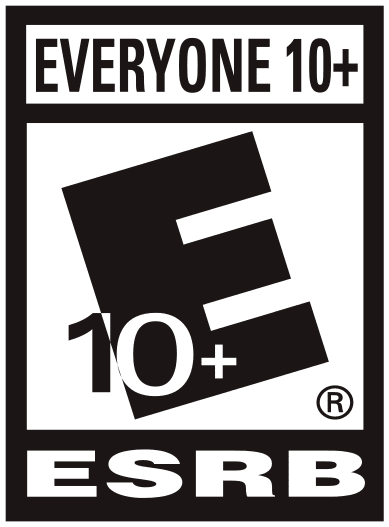 Can a game that is essentially promotional material for another larger game be worth your attention? Spoiler alert: If you’re a fan of NES-era Castlevania entries, Curse of the Moon is absolutely worth your time. The story for Curse of the Moon is a simple one. A swordsman named Zangetsu was wronged by demons and vows to slay every one that he sees. Along the way, he recruits three other travelers: the acrobatic whip user Miriam, the magic-slinging Alfred, and the vampiric Gebel. The four fighters band together to journey to a castle and slay an evil darkness that rests at the top. It’s nothing revolutionary as far as storytelling goes, but it gets the job done, especially toward the end. Zangetsu uses a short-ranged sword to vanquish his enemies, no matter how big they are. Where Curse of the Moon shines brightest is in its gameplay. Every character feels and controls like the ones from NES-era Castlevania games, and switching between four protagonists on the fly is very reminiscent of Castlevania III: Dracula’s Curse. Step for step, each character moves at a familiar pace, and once a character jumps, you can’t control their trajectory in the air. Zangetsu offers a short-range sword stab as an attack, whereas Miriam’s long-range whip feels right at home in a game by Iga. Every character has a way to deplete the weapon meter, the resource the heroes use to launch more powerful subweapons. Gebel, however, instead consumes the weapon meter to transform into a bat to freely fly around, providing access to previously unreachable paths. Miriam functions similarly by having the highest jump and the ability to slide. The map design of Curse of the Moon accommodates for the freedom of mobility. 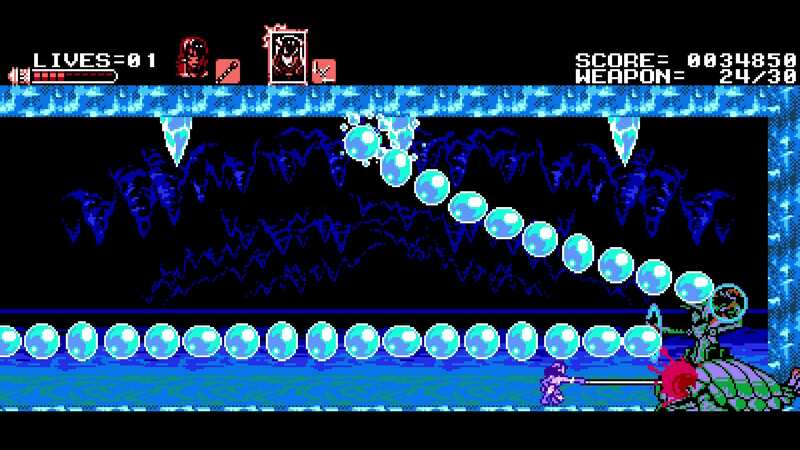 All eight of the stages are built to have a beginning and end, but players can take different paths to get to the boss at the end of every level. The various bosses all have memorable designs, and each requires a different set of tactics to defeat. In some instances, certain characters and sub-weapons are more effective against specific enemies, and figuring that out gives a sense of accomplishment akin to uncovering a boss’s weakness in a Mega Man game. Miriam’s whip feels like the most Belmont-like weapon in the game. Therein lies a big flaw with the game, however. Much like many old-school platformers, you have a certain number of lives before it’s game over. When one of your four characters die, you have to start over at a checkpoint, but it doesn’t cost you a life. You will have to go through the rest of the stage without that character, though. If you lose Miriam, you suddenly lose access to any higher platforms or paths hidden behind a low opening, not to mention the loss of the iconic whip. When you lose all four of your characters, then it costs you a life. The fact that your progress in the stage is reset when one character dies is frustrating, sometimes tempting you to kill off the other three to regain that lost hero. Aside from the frustrating choice in game design, the rest of Curse of the Moon is a visual and aural treat to play. The game is billed as a retro-style action title, and that description fits in so many ways. The soundtrack is inspired by 8-bit classics like Mega Man and, of course, Castlevania, and for the most part, it gets the blood pumping when you’re tackling all the demons across the land. The graphics are extremely faithful to the old-school era as well. Instead of opting for higher fidelity pixel art like Owlboy, the game goes for an old-school 8-bit art style. Gebel can not only transform into a bat, he can also unleash a trio of them to attack demons. 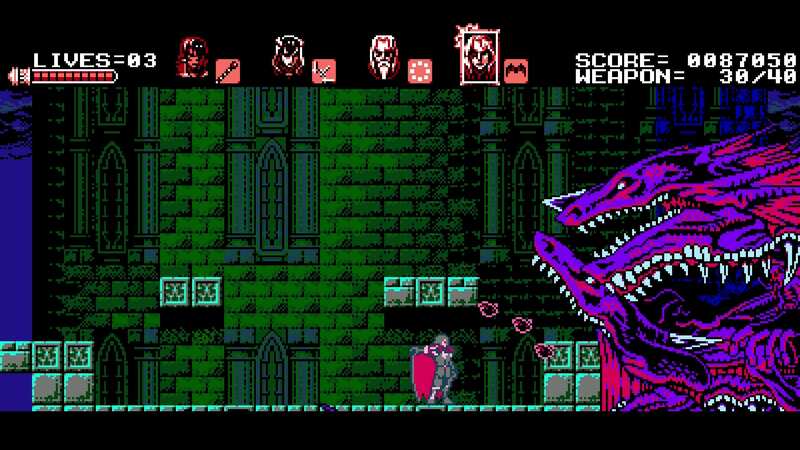 If you’ve played a Castlevania game before — or one of the hundreds of games inspired by it and Metroid — this all sounds pretty familiar, maybe even run-of-the-mill. But there’s something about how Curse of the Moon plays that evokes a powerful sense of nostalgia, the kind of nostalgia that can’t be ignored. The 8-bit graphics, the chiptune sound design, and the old-school gameplay harmoniously mix together to make a game that feels like it loaded straight off a cartridge.